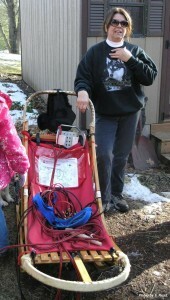 Ann Nelson, of Howard City, talked about her life-long passion for mushing, the care of her 16 Siberian Huskies, the hand-crafted dog sleds that she and her husband, Ted, design and sell, and why the absence of typical Michigan winter is a huge disappointment this year. Winter has been wacky this year. Unusual season temperatures and on-again, off-again snow has left most Michiganders puzzled. For those who dread The Mitten State in the cold months, it’s a relief from the bitter months of deep snow. For winter sport enthusiasts, however, it’s a crushing disappointment. Such is the case for mushing devotees Ann and Ted Nelson, of Howard City. 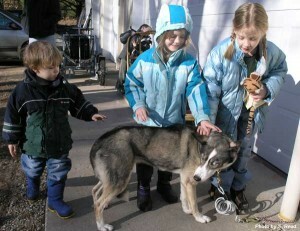 The Nelsons own Thunderfeet Kennel and Dogsleds, where they care for their 16 Siberian huskies and custom create dog sleds. For the Nelsons, dog sled racing is not just their passion, but their life. “Normally we have a race each weekend in January and February into March, but winter isn’t cooperating this year,” Ann explained to a group of homeschool families who enjoyed a field trip to Thunderfeet this month.